One of the really unfortunate parts about the Sailor Quartet is that they were introduced to the story right at the end of the Dream arc, which also happens to be when Sailor Moon was blowing up1 with new characters appearing left and right — and most of them were Sailor Soldiers. I guess we should be happy that we got as much information about them as we did, when you consider that other manga characters were considered lucky to have their whole story arc, from introduction to death, take place in just a few short pages. After destroying Nehellenia, Sailor Saturn approaches (Neo?) Queen Serenity3 with the four marbles/orbs that contain the spirits of the Amazoness Quartet and asks her to imbue them with the Silver Moon Power. When the Amazoness Quartet reappear, they are now wearing Sailor uniforms and claim to have the power of the four asteroids — Ceres, Pallas, Juno, and Vesta. Incidentally, the Amazoness Quartet are considered sisters, and their birth order is determined by the order in which their respective asteroids were discovered. Sailor Ceres explains that they were supposed to be sleeping deep in the Amazon (rain forest? warehouse? headquarters? ), but Nehellenia recognized their power and placed a curse on them, forcing the Quartet to work under her. Now that they are freed from Nehellenia’s nightmare, the Sailor Quartet will go back to their slumber. It’s still too early for them to fulfill their role as Sailor ChibiMoon’s guardians, so they will lie dormant until that time comes. … and absolutely no reason is given for that fourth and final bullet point. We’re introduced to the Sailor Quartet, then they say that it’s “still too early” for them to truly awaken, and they go back to sleep to await the time where they can serve Sailor ChibiMoon and then come back into the past. While I can’t say anything useful about the issue of them waiting until the future to come back into the past,4 I think we can take a decent crack at their connection to the Moon. Basically, the key to finding an explanation to this is that we need to completely forget about the asteroid angle. As fun and interesting as it is, sometimes the space connections are just a matter of plot convenience. Rather, the more important connection here is in their pre-transformation name: we need to look back to the Greek legend of the Amazons. I’m sure you can see where I’m going with this now, right? The Amazoness Quartet are named after the Amazons. The Amazons worshiped Artemis.7 Artemis is the Greek name for the Roman goddess Diana who supplanted the Moon goddess Luna. Thus, the Amazons, in a way, worship and serve the Moon. Though I admit that this is a bit of a logical leap, it’s not too far outside the realm of possibility when you consider how much research Ms. Takeuchi did into mythology — and especially that of the Greek and Roman gods — when she was creating the series. As much as I would like the asteroid connection to make sense and somehow tie into the Moon, as far as I can tell there’s just nothing there. Most likely, the asteroids were probably chosen simply because she was running out of celestial bodies in the solar system to use for Sailor Soldiers, and the asteroid belt happened to be the most convenient “neutral” choice (since they’re not associated with any other planet). What do you think of this explanation, then? Does it actually explain anything away, or could it just be a false lead of only vaguely-related concepts? 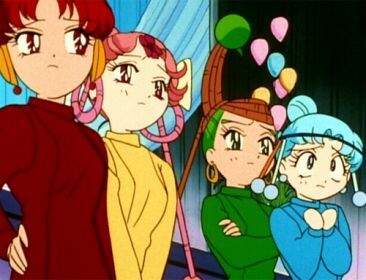 If you have any other theories for how the Sailor Quartet ended up as ChibiMoon’s guardians, I’d love to hear them! ← Is the Sailor Moon Universe Full of Ghosts and Other Monsters? I love seeing more about the Dream arc/SuperS, and one of those questions I haven’t really thought about. I like the Diana/protector of young girls connection. Makes more sense of why the Sailor Quartetto would be acting as Chibi Moon’s bodyguards. Too bad this didn’t get nearly as much attention as it should have. The Quartet is more tied to / modelled after the Inners and their mythological connections. – The goddess Ceres is associated with fertility, not unlike Venus. Sailor Ceres is Sailor Venus’s counterpart. – The goddess Athena – known as Pallas Athena – is associated with wisdom. Sailor Pallas’s counterpart is Sailor Mercury, the team brain. – The goddess Juno was Jupiter’s wife, and Sailor Juno is Sailor Jupiter’s counterpart. – The goddess Vesta is associated with hearth, and thus, fire. Sailor Vesta is Sailor Mars’s counterpart. 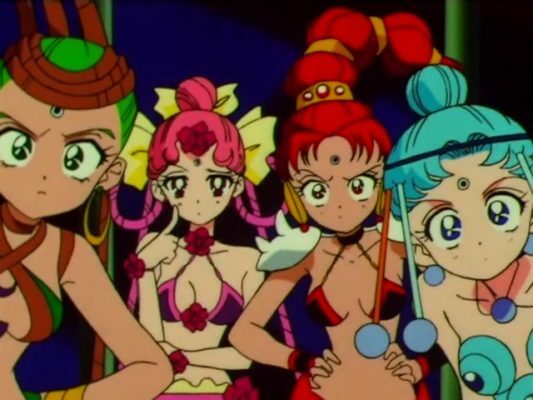 I think you’re right about the “worshipping Artemis” angle, since there doesn’t seem to be any explicit connection between the Quartet and Chibimoon apart from them mirroring Usagi’s team. But other than that, these four happen to fit into the normal “mythology/space” naming pattern, so there’s nothing unusual about it. This is because the Quartet seem to be designed to be the opposite of the Inners, personality-wise (though I guess it applies somewhat more to the manga due to Rei’s change in the anime). – CereCere is feminine, contrasting Minako’s usual tomboyish behavior. – PallaPalla is childish and naive, whereas Ami is the smartest on her team. – JunJun is a tomboy and proud of it, while Makoto emphasises her femininity in various ways. – VesVes is appropriately fiery, while Rei is calm. And, IIRC, their ages are also in the opposite order compared to the Inners. It’s a shame we don’t get to see much of them; I wish there was another “Chibiusa’s Picture Diary” chapter about her adventures with her team. The only thing about them that’s making me lose my sleep is… Sailor Ceres having a pink outfit. Seriously. I mean, what the hell was Takeuchi thinking? Not only is pink already Chibimoon’s colour (so it looks weird when they stand next to each other), but also yellow is Ceres’ main colour, which “incidentally” suits the Venus counterpart thing. I wish we could see more of them and how it all works (Hi, SM Crystal!). I remember being pleasantly surprised and… satisfied that (in the manga) the whole Moon senshi idea came full circle and Chibimoon even got her own guardians. I mean, while CereCere’s outfit has some yellow, it’s still mostly pink. 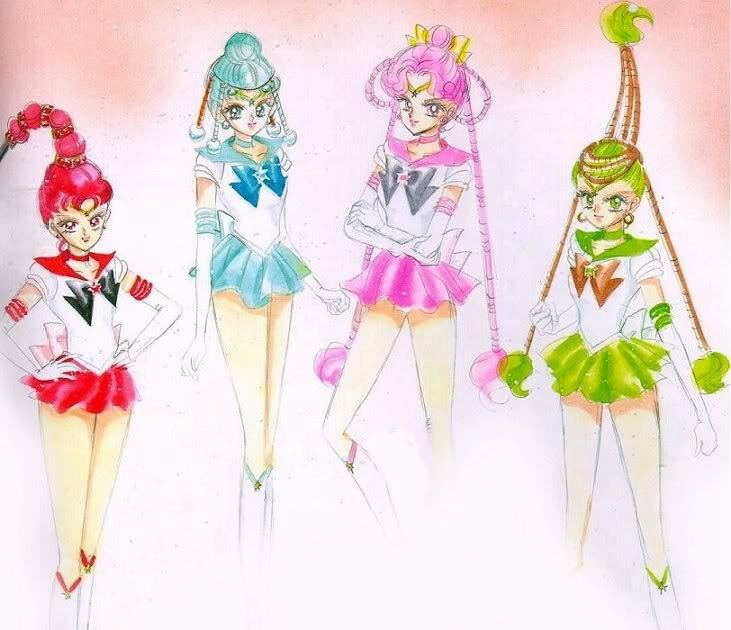 I actually like that Sailor Ceres’s outfit is pink; I think she’d look weird in yellow, and while it may be a bit odd for her outfit to be the same color as Chibi Moon’s, it at least slightly subverts the idea that the Quartet are just replacement Inners. Well Naoko Takeuchi did give Cerecere in her Amazon form a mostly pink outfit so I guess she wanted her Sailor Outfit to match. If she wanted her outfit to be yellow then she honestly did a bad job not making both outfits mostly yellow. Then again we all know she can be inconsistent with the designs she likes. All of the Asteroids that the New Guardians were given are part of Western Astrology. I initially assumed it had something to do with that.